Handcrafted Herbals - Good for you and Safe for our Planet!!! 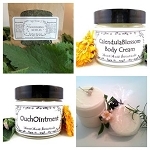 Handcrafted Herbal Remedies - Good for You AND Safe for our Planet!!! MoonMaid Botanicals' is a grassroots, woman owned herb company located in the Smoky Mountains of East Tennessee. In 2020 we are celebrating 25 years in business. Cynthia, herbalist and owner, is dedicated to providing high quality herbal products that are good for people and safe for our planet. She has handcrafted wild yam alternatives to bio-identical and prescription hormones and other herbal remedies and skincare, since beginning in Sebastopol, California since 1991. MoonMaid's remedies are pure, simple, chemical free formulas loved by women worldwide!! After a lifetime of using herbs for her own health issues, the passion for plant remedies continues. Over 25 years in business we have watched menopause become big business, often at the cost of a woman's health. Since the beginning the wild yam formulas that were the first products, have only grown in popularity. Cynthia was an unofficial expert on menopause before her mid 30's and has officially dubbed herself “THE Menopause Herbalist.” She is now offering consultations on how herbs may be beneficial for your menopause. Learn more about a consultation. It is Cynthia’s commitment and passion to remind women that “our periods, birth and menopause are life transitions to be embraced, not a sickness to be treated." All of MoonMaid's formulas are perfume, chemical and hormone free!!! We use only natural essential oils, organic or wild-crafted herbs and the finest oils we can find. Re-cycling is a particular passion. It is harder, we know!!! We do what we can and encourage you to do the same. We package all products in recyclable glass because plastic is simply not acceptable. We source all ingredients in the USA as often as possible and strive to be a Zero waste company. Nothing we use is ever ever ever tested on animals. As well as hand-crafting products, Cynthia and MoonMaid are part of United Plant Savers Botanical Sanctuary network. In 2019 a HipCamp will be launched on the land. What is HipCamp? Kind of like an Air B and B situation, but you are in a tent, on a beautiful piece of land with a small pond full of frogs and goldfish, raised bed gardens using only composted material from the land, and Medicine Woods. This short jaunt in the woods is jam packed with medicinal plants like goldenseal, ginseng, black and blue cohosh, nettles and ton's of wildflowers. Check out the Botanical Sanctuary page for a bit more info. New thoughts, new ideas and what's going on can be found on the blog. Thinking of purchasing on Amazon because it may be a bit "less expensive?" Just know......I am not the shipper and you sure will not get MoonMaid's customer service. Read more here.